"A lovely post-impressionist painting by an artist who exhibited in the famous Armory Show of 1913." An extraordinary Southern Regionalist painting: a glimpse of the "Old South." One of Girard’s best renderings. "A very lovely and interesting painting, with a Nashville subject-matter, by a very important Tennessee artist." “ROBERT E. LEE” (Copyrighted in 1870 by Bradley & Company) Engraved by A.B. WALKER after a photo from life. A strong painting evocative of the period. ART DECO MODERNIST IMAGE OF ADAM CLAYTON POWELL, JR.
An extraordinary and powerful early rare rendering. Verso: "Painted Feb. 4, 1935"
"AT THE OPERA” by Helen Farnsworth Sawyer, N. A. “PASTORAL LANDSCAPE” by Edward Gay, N. A. A pleasing, snowy tonalist landscape. “WOMAN WITH PARASOL” by Ernest Roth, N.A. A large, well executed painting of New York's Hudson River Valley. A meticulously rendered watercolor in a beautiful period frame. A masterfully painted watercolor in an ornate period gold leaf frame (likely to be the original). A very well rendered painting with a maritime theme. Probably Strauser’s wife, a rare early work by the artist. 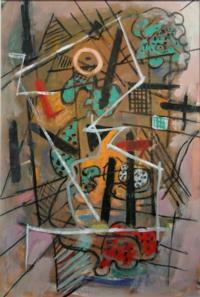 A highly creative mid-century modern painting by an accomplished artist.